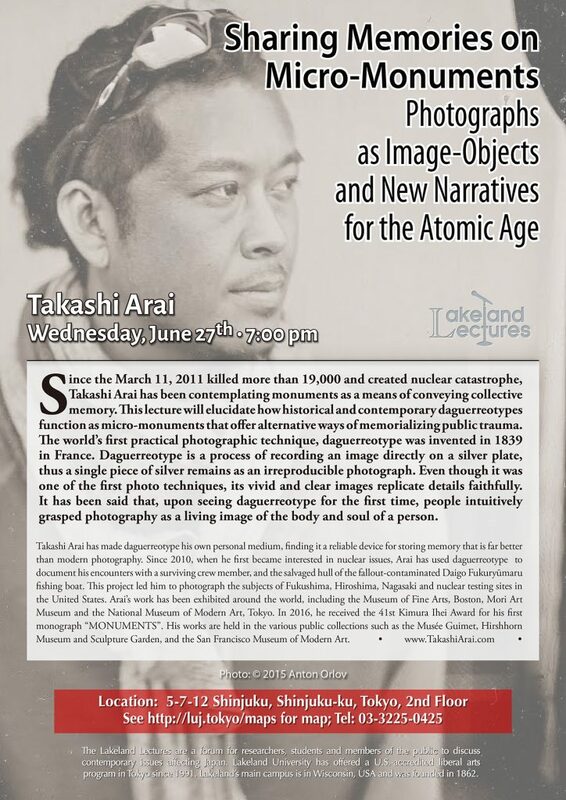 Since the March 11, 2011 killed more than 19,000 and created nuclear catastrophe, Takashi Arai has been contemplating monuments as a means of conveying collective memory. This lecture will elucidate how historical and contemporary daguerreotypes function as micro-monuments that offer alternative ways of memorializing public trauma. The world’s first practical photographic technique, daguerreotype was invented in 1839 in France. Daguerreotype is a process of recording an image directly on a silver plate, thus a single piece of silver remains as an irreproducible photograph. Even though it was one of the first photo techniques, its vivid and clear images replicate details faithfully. It has been said that, upon seeing daguerreotype for the first time, people intuitively grasped photography as a living image of the body and soul of a person. Lakeland Lectures are a forum for researchers, students and members of the public to discuss contemporary issues affecting Japan. Lakeland University has offered a U.S.-accredited liberal arts program in Tokyo since 1991. Lakeland’s main campus is in Wisconsin, USA and was founded in 1862.